We invited long-time friend of Powder Byrne and head of the Swiss Ski School Arosa, Noldi Heiz, to share his insights into his perfect ski day. He gives us the inside track on Arosa's not-to-be-missed runs, his pick of the mountain restaurants, and a glimpse of the adventures he and his colleagues can unlock for those looking for a slightly more intrepid experience. "The snow-sure area of Arosa Lenzerheide offers 225km of prepared slopes at altitudes of up to 2‘865 meters above sea level. Wide descents that call for large radius turns or steep hills that fully test the grip of your skis make the heart of every winter sports athlete beat faster. The Urdenbahn railway, the fastest aerial tramway of Switzerland, transports its guests between the Arosa Hörnli and the Urdenfürggli within 3 minutes. And since the opening of the chairlift Obertor, our snow sports experience of Piz Scalottas to the Arosa Weisshorn is simply perfect. Guests have the choice of a wide range of slopes for every level. At the end of the Schanfigg valley and free of any transit traffic, Arosa offers fun on the slopes for every level. 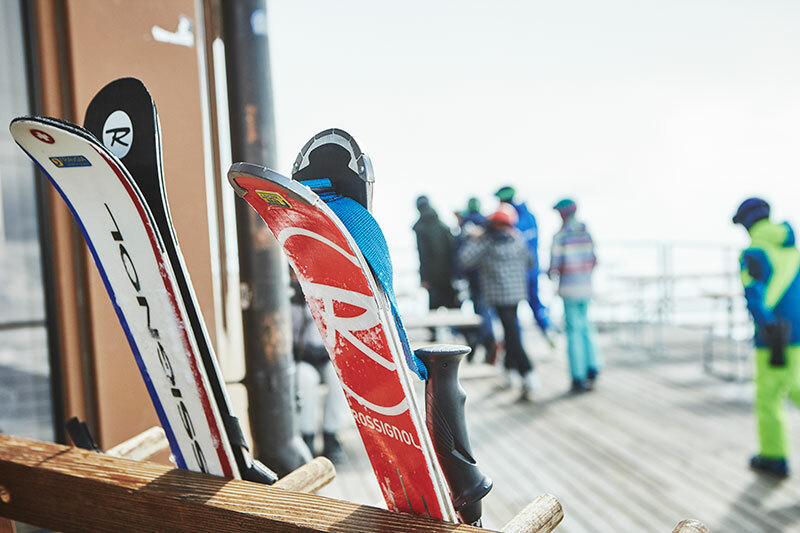 Be it the challenging descents with a fantastic view from the Weisshorn peak, or the panoramic and delightful slopes on the Brüggerhorn, where you can find mountain bars with sun decks to enjoy all along the slopes. Adrenalin junkies find their kick while testing their maximum speed at the Helly Hansen High Speed on the Tschuggen hill. Lenzerheide offers its guests two valleys, the east, and the west side. Between Piz Scalottas and the Stätzerhorn, you can find the Swisscom Ski Movie Race Track, the fun slope and the JibArea Stätz, two family slopes, the kids land Auarara and much more. The ‘Silvano Beltrametti’ world cup track is not the only excellent snow sports attraction on the east side. In the morning, the slopes offer good grip and plenty of space for racy turns. The Rothorn peak at 2,865m above sea level allows for a 360˚ panoramic view across 1,001 mountain summits. The alarm is set early in the morning, the skis are waxed and the edges sharpened – today it’s only skiing, in all its facets. We’re taking the first gondola to the top of Mount Weisshorn to enjoy some early bird skiing just as the sun rises. Being the first on the freshly-groomed slopes (run 10) is an incredible feeling! After a hearty breakfast at the restaurant with a 360° panoramic view, we hit the slopes to reach the Urdenbahn which will bring us to Lenzerheide in the 3-minute ride over the Urden Valley. From the Hörnli to the Urdenfürggli is breathtakingly beautiful. From here, a challenging red slope (run 20) takes us to the start of the black ‘Silvano Beltrametti’-track, an unmatched FIS World Cup Slope, where the female’s races will take place 27th January 2018. Pure adrenaline! Here you can really test your skis’ edges and your skills. Also, our stomachs are growling and it’s the perfect time to have a delicious lunch at the Chili Hut at Stätzertäli (run 78). Whether it’s a hot chilli con carne or a plate with local Bündnerfleisch (air-dried meat) and cheese, you'll love this cosy mountain hut. You will feel rested, refuelled and ready to run the giant-slalom race piste and check how fast you are! The numerous blue, red, and black slopes on Lenzerheide’s west-side will make every skier’s heart beat faster and the varied choice of mountain restaurants will leave no one hungry. While we are in Lenzerheide, we should not miss the run down to Churwalden (run 79), especially because there is be a gondola designed by Porsche Design to get us to the top of the mountain again. That’s what we call riding in style. On the way back to Arosa, there’s plenty of opportunities to not only challenge our skiing but also our après-skiing. How about a legendary Munggapfupf at Carmenna hut’s Munggaloch. After a perfect day of skiing, we truly deserve it! You’d rather hit the powder runs? Then we suggest you ride the snow-covered couloirs and steep hills lined with covered rock ledges. The Parpan Rothorn and the Arosa Weisshorn are amongst the most famous Swiss freeride mountains. The off-piste ski safari from Arosa to Tschiertschen, Lenzerheide and back to Arosa presents is a completely unique experience. The tour not only requires a lot of experience but also a special combined ticket valid for the facilities in Arosa Lenzerheide and Tschiertschen. Make sure to use a local mountain guide if you'd like to experience it for yourself. To find out more about a trip to experience Arosa Lenzerheide's slopes for yourself, call 020 8246 5300 or click here. All the best of Lenzerheide, told by the man who knows these slopes best.